Golden Fist International Karate Academy, the leading martial arts and fitness centre operating in the UAE for over 24 golden years, with its headquarters in Dubai. 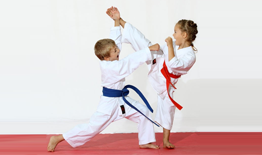 Since 1992, and now with over 20 reputable venues throughout the Emirates, Golden Fist Karate Club conduct classes in Karate, Kung-fu, Yoga, Gymnastics, Kids Mix Martial Arts, MMA, Budokan – the ultimate weight loose program with yoga and Self-defense programs. 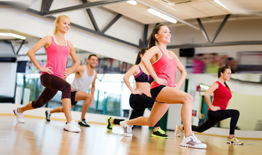 In addition, we hold a comprehensive schedule of fitness programs on a weekly basis. Our holiday summer and winter camps are very popular with children and youths with fun filled fitness programs and games. We are proud to be the team behind the internationally acclaimed annual Karate tournament ‘Dubai Budokan Cup’ and the colorful yoga event in the Middle East ‘Dubai Yoga Mela’. Our corporate capacity extends to conducting National and International corporate yoga and fitness events. Additionally, as part of our portfolio we provide motivational speaking sessions for schools and corporate bodies. 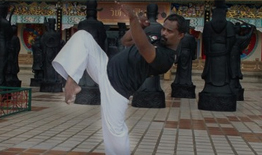 A dedicated and qualified team of fitness instructors conducting the sessions throughout Dubai and neighboring emirates under the direct supervision of Renshi Renjith, the Grand Master Golden Fist Karate Club. Across all our venues we pride ourselves in our positive approach to activating the UAE, by providing a top class service to ensure that our customers and venues are completely satisfied, knowing with a sense of pride that we bring quality programs delivered by knowledgeable and professional staff. Renshi Renjith, the Grand Master Golden Fist International Karate Academy. Renshi is well known throughout the UAE as an influential senior fitness trainer. The National Chief of KBI – Australia. Authorized karate Instructor under the UAE tae-kwon- do and karate federation. Senior Sifu at Shaolin Kung-Fu. Well known sports personality, columnist and author. Regular presence in TV, Radio and other Media’s on martial art, health and yoga related programs.